Purchased in 1986, CedarCreek released its first wines in 1987 and was one of the first eight pioneering wineries of BC. With four generations of agricultural heritage and more than three decades of experience, we have pursued perfection and produced some of the valley's best wines resulting in CedarCreek being twice recognized as "Canada's Winery of the Year". Today, we look proudly towards the future to further promote our region. The story of CedarCreek is rooted in the vision of Senator Ross Fitzpatrick. Born and raised in the Okanagan, he worked his way through university in the orchards and fruit packing houses that dotted this beautiful valley. Although education and a business career led him away from the Okanagan, the dreams of what the fertile soil and climate of the valley could do were never washed from his soul. Years later his success in business afforded him the opportunity to fulfill his boyhood dreams by acquiring an orchard and small vineyard near Kelowna. In 1988, just as he clenched his first fistful of soil from his farm, the small wine industry in the Okanagan was in danger of disappearing with the introduction of the North American Free Trade Agreement. But in Ross Fitzpatrick's mind this uncertainty presented the challenge to begin the renaissance of our grape and wine industry. At CedarCreek the hybrid grapes gave way to new plantings of vinifera vines, the small basement cellar was transformed into state of the art winemaking facilities and the very best in viticulture was applied. This pioneering was tempered by patience and perseverance which became his mantra. These ideals matured into CedarCreek's philosophy: "Respect the land, honour tradition, pursue perfection." 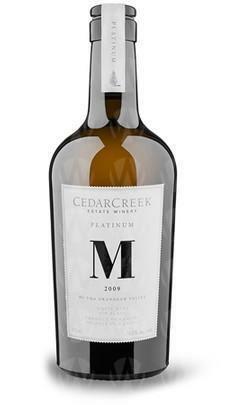 In February of 2014 the Fitzpatrick family announced the transfer of ownership of CedarCreek Estate Winery to the von Mandl Family. With this, two of the region’s pioneering winemaking families have come together with a shared vision for the Okanagan Valley, one that will continue the Fitzpatrick family legacy for generations to come. Our knowledge of the terroir of the Okanagan and dedication to the craft have brought many awards and international acclaim, to our winery and our region. We are committed to building on our success by continuing to refine our approach to wine growing. Passion, tenacity, care and hard work are vital but above all we seek truth in wine. And the results show in every bottle. On that, you have our word. With over three decades of wine growing experience, we believe that we have the right varietals planted in the right sites. We grow the Okanagan aromatics Riesling, Gewürztraminer and Ehrenfelser plus the more full-bodied whites; Chardonnay and Pinot Gris to the north at CedarCreek. Our vineyards in Osoyoos - with the extra heat units - are dedicated to our Merlot, Meritage, Syrah and the occasional Cabernet Sauvignon. 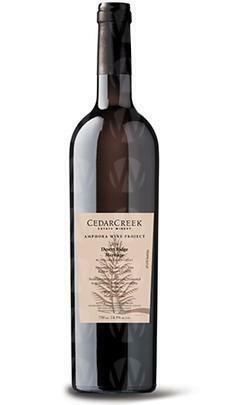 Almost half of the CedarCreek Vineyard is planted to the quintessential food wine – Pinot Noir. 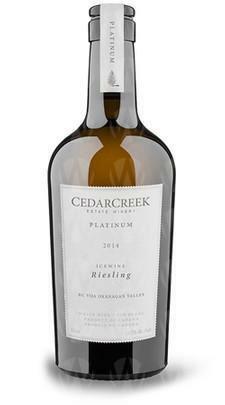 CedarCreek is proud to announce that their 2014 Platinum Block 3 Riesling was named Best Canadian White Wine over 15£ at the prestigious Decanter World Wine Awards in London. Rated 95 Points, the win follows last year’s Decanter World Wine Award for their 2012 Platinum Block 2 Pinot Noir as Best Canadian Red Wine over 15£. Our wines are carefully grown, caressed and finessed rather than simply made, bottled or produced. We believe that wine is elevated from product to craft by careful attention to all aspects of viticulture and winemaking; choice of land, selection of varietals, clones, rootstocks, pruning, cropping, hang time, press method, barrels, time in oak, blending and bottle aging. We take all the necessary steps and then a few extra to express the highest quality of fresh fruit and natural acidity from our region in every bottle. We craft two tiers of elegant wines and work extremely hard to ensure that you enjoy your last glass as much as your first. Our very best wines are designated "Platinum" - it's our reminder that the choices we make have to add up to one better than gold. We believe that we make the very best wines in the Okanagan Valley. In fact, we believe our wines are as good as any made in the world, but we will provide that, rather than claim it. And the results show in every bottle. On that, you have our word. Member Benefits GET THE FIRST TASTE OF OUR NEW RELEASES. We ship you a half case of new releases three times a year – spring release aromatic whites, fall release reds and whites plus our full-bodied Platinum reds in February. You get early access to hard-to-get wines and first chance to purchase more. The estimated cost for all three releases, totalling 18 bottles, is $500, but shipping to your door is absolutely free. (NOTE: Non-BC members receive 15% off each release, but shipping is billed at the winery’s discounted rate.) ADD TO YOUR ORDER. SUBTRACT 15%. Add six or more bottles to your Platinum Club order and we take 15% off the price of those wines. SHOPPING AT THE WINERY? TAKE 15% OFF. All purchases made at the wine shop are discounted 15%. Just let us know you’re in The Club. EXCLUSIVE ON-LINE DISCOUNTS. Members get exclusive access to limited time offers and special pricing. VISIT THE WINERY LIKE FAMILY WOULD. Platinum Club members get an annual private Proprietor’s Room tasting for you and five guests. Advance booking is required. You also get unlimited complimentary tours of the winery with two guests. Tours start at 11am, 1pm and 3pm from May to October. FRONT OF THE LINE CONCERT TICKETS. You get priority ticket access to our Summer Sunset Concert Series. RARE LIBRARY VINTAGES. Now and then, we’ll reach into the vault and make some library vintages available exclusively to Platinum Club members. TRIVIA FOR WINE GEEKS & PRIVATE EVENTS. We keep you up-to-date with a quarterly e-newsletter that includes tasting notes on new releases, cellar tips and videos from our winemaker. What more, we’ll also invite you to private member only events. Some on us, of course! TOURING WINE COUNTRY? LET US PLAN IT FOR YOU. As a Platinum Club member, you have exclusive access to your personal Wine Country Concierge at Cedar Creek. If you need help planning a trip to the Okanagan, finding accommodation or tracking down a great restaurant, just ask. TERMS & CONDITIONS CANCELLATION AGREEMENT: Members must receive a minimum of 3 shipments after which any cancellation requests must be sent in writing via e-mail to concierge@cedarcreek.bc.ca Members will get a pre-shipping notice by e-mail 4 weeks prior to shipping date. Member credit cards will be charged two weeks before day of shipping. Additional charges may apply for shipping to rural locations. Incremental case discount only applies when added in increments of 6 to scheduled Platinum Club shipment. Incremental orders must be received at least 15 days prior to shipping date. On-site discount only on items purchased by and picked up in person by Platinum Club member. Proprietor’s room tasting and tours based on availability and advance booking, Platinum Club member must be present. Tours available three times daily from May to October only. CedarCreek Estate Winery is located 20 minutes from downtown Kelowna – making it an ideal destination for locals and those touring wine country. Situated on a hillside, you are treated to a panoramic view of lush vineyard, lake, immaculate grounds and beautiful gardens. CedarCreek is committed to providing guests an intimate and educational experience in an exceptional setting. Wineshop Hours Open Daily May 1 to June 30: 11:00 a.m. to 6:00 p.m. July 1 to September 30: 10:00 a.m. to 7:00 p.m. October 1 to April 30: 11:00 a.m. to 5:00 p.m.
Our Vineyard Terrace Restaurant is open daily at 11am. We look forward to your visit!